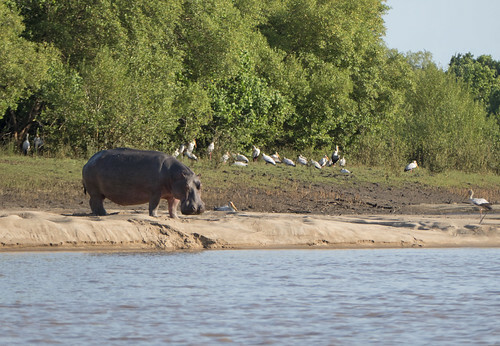 The Saadani National Park covers 1100km2 and is the only wildlife sanctuary in Tanzania bordering the sea. The climate is coastal, hot and humid. It offers a unique combination of both marine and mainland flora and fauna. The yellow-billed stork has been observed to follow moving crocodiles or hippopotami through the water and feed behind them, appearing to take advantage of organisms churned up by their quarry.